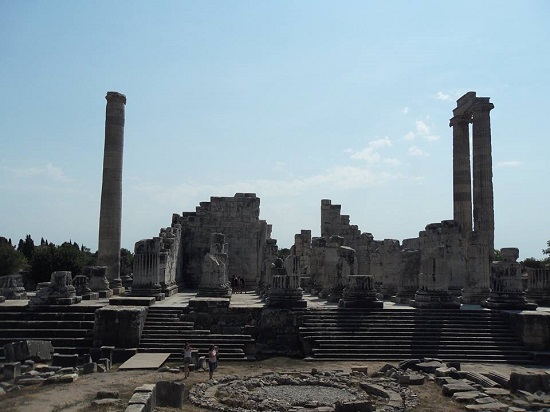 The small holiday resort of Didim on the Aegean coast of Turkey has one major landmark to boast about, and that is the majestic Temple of Apollo. Standing at the entrance to the resort, its size pales in comparison to other main ancient sites like Ephesus, but its historical importance as one of the greatest oracle sites of the old world has secured it a prominent place in history books. Surrounded by souvenir shops and restaurants marketing a sunset view of the temple, this former pagan worshipping site takes just an hour to explore but will intrigue everyone with its tales of days gone by. The Temple of Apollo’s historical story centres purely on its purpose as a cult prophecy centre. Linked to the city of Miletus by a 14-kilometre stretch of road, now called the sacred way, historians and archaeologists traced remains of the first temple back to the 8th century BC. The Ionians can take credit for this, but artefacts and ancient texts have suggested that it was an oracle shrine before that. 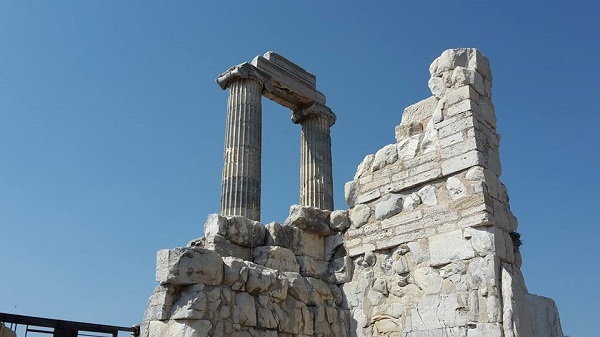 In the 7th century BC, the Lydia King Croesus attempted to expand the temple and in 550BC, the Branchids, a collective group of soothsayers, and priests who claimed to be descendants of a youth favoured by Apollo took over control. Their glory was short lived because, in 494BC, the Persians ransacked and destroyed most buildings and cities in the area, including that of nearby Miletus. Naturally, all historical tales of war focus on the winners, the losers, and the newcomers and in this case, it was Alexander the Great in 334BC, who rode into the glorious limelight of the Temple. The oracle proclaimed him as the son of Zeus, which pleased him greatly so he started construction on a new temple that would be the best anyone had ever seen. Expert artisans toiled under the summer sun for many years, which turned into centuries. Sadly, even though Alexander the Great had died, his vision of a temple that would rival the Delphi in Greece would never materialise. A new religion was on the horizon, and it was spreading like wildfire. It deemed worshipping pagan gods as sinful, and people turned to the new word of Jesus and Christianity. The supreme reign of the Apollo Temple was over. Naturally, over time, it fell to ruins because of neglect, although there are reports of attempts to convert it into a church. By the 17th century, it was completely unrecognisable, and just a random collection of ruined stones scattered over the land. 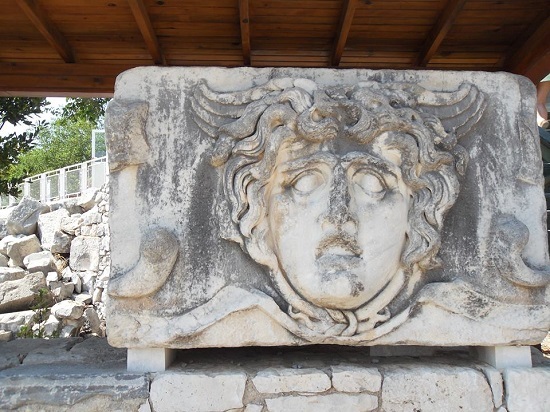 In the early 1900s, German archaeologists arrived in Didyma and disregarded any evidence of a church since their primary interest was the Hellenistic remains and original pagan temple. Excavations work started and has continued over many years to reveal the Temple as we see it today. Immediately upon entering, visitors see the tall columns dominating the skyline. Unfortunately, only three of the original 72 columns still stand yet their height is impressive especially when backed by the sun setting to the right-hand side. Nearby, Medusa's head carved into a large boulder sits quietly and unobtrusively as if certain of its current day mascot status adorning travel leaflets promoting the area. Climbing the flight of stairs leads visitors to the base of the fallen columns, and it is here when the humongous size of them becomes apparent. Historic carvings on the wall of the temple reflect the intense labour of the stonemasons that constructed the columns and by comparison, one column needed 20,000 workdays to be completed. From this section, two tunnels lead into a large courtyard known as the Adyton. Within this area was a smaller temple used by the soothsayer priestess who also had a holy spring water basin. From here, she would tell her prophecies but never to the seekers direct who had bought a sacrifice in return. A person acted as a go-between between the two parties, therefore increasing the sacred ambience of the temple of her followers. If history is a passion, fans will be interested in the sacred route from the Temple of Apollo to Miletus ancient city ruins. Now an official walking path, trekkers follow the path that former pagan worshipping citizens completed annually in their desire to consult the high priestess. Many great emperors including Julius Caesar consulted the oracle of Didyma but for the citizens of nearby Miletus, it was even more important. 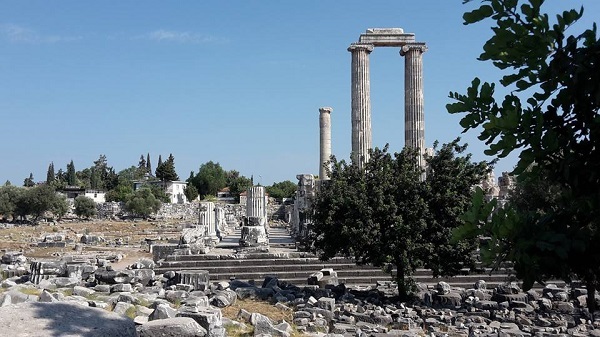 These days, a popular tour is the three ancient sites of Priene, Miletus, and the Temple and this article talks more about it.